I recently read an article1 calling for an underground revolution. The authors described a sustainable farm system “that has a rich soil life and is characterised by moderate resource inputs, a high rate of internal regulatory processes, low nutrient losses and high productivity”1. I don’t know about you, but that sounds like a great system to me. They described the mechanisms of achieving this as soil ecological engineering. This is quite a mouthful. In this blog I will try my best to explain what they meant. In essence it entails learning from what happens in nature and implementing it in our intensive agricultural systems, so that we can benefit from the services that soil provides in nature. 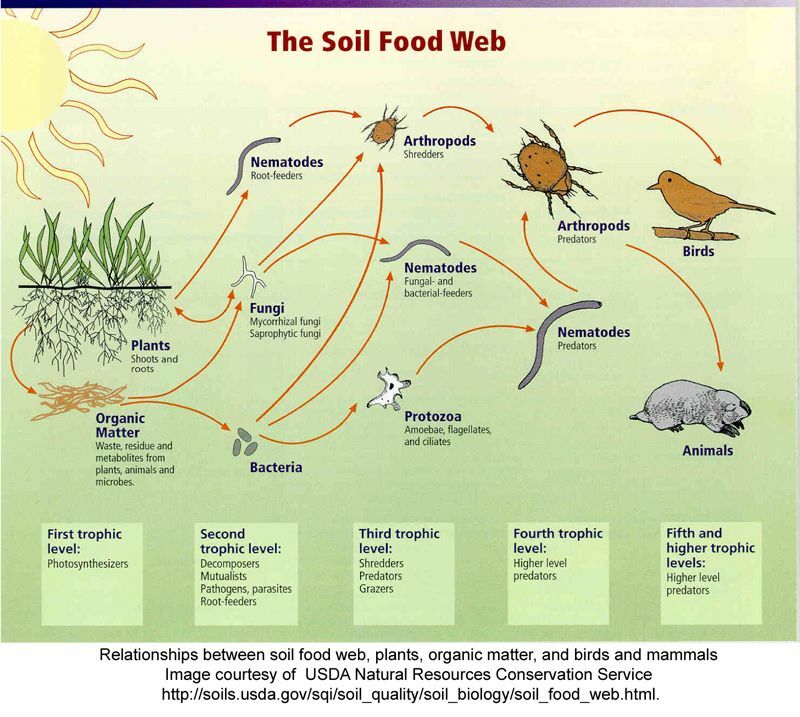 A summary of how the authors described the soil ecosystem is that soil animals, bacteria and fungi break down organic matter, making nutrients available to the soil food web and for plant uptake. Predators in the soil feed on other soil organisms, creating a complex of feeding activities which further releases nutrients in the soil. Plants use these nutrients to grow, increasing in biomass above and below ground. This biomass is organic matter which eventually returns to the soil to be decomposed again by the soil animals, bacteria and fungi. This is depicted in the soil food web below. In nature, this is the main mechanism which makes nutrients available to soil life and plants. In intensive agricultural systems, we tend to (over)provide all of the nutrients needed by plants through expensive fertiliser inputs. The authors point out that research has found that intensive agriculture leads to much simpler soil food webs, than in natural systems. These simpler food webs have smaller-bodied soil organisms and fewer functional groups. The agricultural practices which have the greatest negative effect are tillage, repeated and intensive fertilisation, pesticide application and low plant diversity. In order to meet the growing global demand for food security, while ensuring environmental protection the authors call for an underground revolution. This underground revolution involves making use of the understanding we have of soil food webs in farm management. This is where soil ecological engineering comes in. Directed soil biological management can be used to improve pest control, improve plant nutrient uptake, reduce nutrient loss, improve soil formation and increase soil carbon sequestration. Some of these practices are only theoretical at the moment, whereas others are already being successfully implemented by farmers. The authors are pointing out that with these practices we can begin moving agriculture away from the current high input, low soil biodiversity, high production intensive systems to lower input, high soil biodiversity, high production sustainable systems. In order to create more sustainable agricultural systems we need to start thinking differently about soil management and the provision of nutrients for plant growth. We cannot continue with this system which relies on the excessive application of expensive and environmentally degrading fertilisers. We need an underground revolution. Bender SF, Wagg C & van der Heijden MG. 2016. An underground revolution: Biodiversity and soil ecological engineering for agricultural sustainability. Trends in Ecology & Evolution 31(6):440-452. Soil aggregates: the armour in your soil What if agriculture could actually have a positive impact?